Mark is a passionate lover of the guitar. 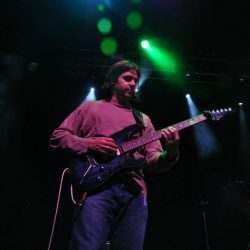 Since picking up the guitar in 1989, he has gained a broad knowledge of theory, techniques and styles. His own tastes in music are eclectic, and include: rock, metal, blues, jazz, fusion, funk, folk, classical, dance, drum ‘n’ bass and hip hop. mastertheguitar.co.uk was launched in 2006 and over the years Mark has helped many many students on their guitar journey establishing a highly regarded and successful teaching business in Edinburgh and now in Arrochar. Mark has enjoyed many additional musical projects over the years from session and theatre work to regular live performances as well as online video tuition. He has performed live with the Edinburgh University Footlights, played at the Edinburgh Festival, performed onstage at Edinburgh’s Hogmanay Celebrations and is a regular deputy guitarist for the rock ceilidh band Teannaich. In addition, Mark was Runner-Up for the SNMA (Scottish National Music Awards) Teacher Of The Year in 2012 and has hosted several Workshops. Always keen to develop and learn from the masters, Mark has attended workshops with the likes of Guthrie Govan, Paul Gilbert, Ron Thal, Shaun Baxter and has been fortunate enough to meet both Steve Vai and Joe Satriani. Dedicated to advancing his own skills, technique and creativity, Mark is equally committed to the development of his students. An experienced tutor, Mark is able to offer a graded syllabus to his students as a means for them to monitor their progress. In addition to this, he is able to offer specialist tuition in advanced techniques, songwriting and recording. It has been said that music is the highest form of emotional expression, and if that’s true, then there can be no more versatile instrument than the guitar with which to express. Despite being one of the hardest instruments to master, Mark remains as infatuated with the guitar as he was when he first started. His aim is to teach every student, regardless of age or experience, with the same passion that drives his own playing; and, most of all, to make the experience as relaxed and enjoyable as possible. Visit Mark’s personal website at markmcguigan.com or check out the mastertheguitar YouTube channel.